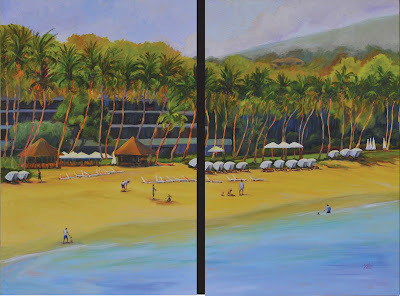 Artist's Comments: After thorough research and numerous studies completed; I was finally ready to start on my first commission project at Mauna Kea Beach. The clients were just finishing their home located just on the slopes behind this picturesque beach. They wanted to bring the warmth of the shoreline into their home and needed a 2-panel painting that would appear on either side of their entertainment armoire. Each panel needed to be a vertical composition but when viewed together, they create a horizontal scene. I chose a perspective looking back over the shoreline onto the wonderful tall palm trees and onto the summit of Hualalai mountain. Other than a fabulous, powder-soft beach, Mauna Kea holds some of the tallest and most graceful palm trees which line the beach and neighboring hotel. Just behind these palms is a dense overgrown jungle that creates wonderfully cool shadows contrasting against the warm shoreline. I created texture in the skyline by using my palette knife to mimic the soft clouds which seemingly snuggle up to the slopes of Hualalai. To contrast this texture, I create the shoreline and ocean with layers of softly painted variations of azure blue and bright turquoise. Throughout the painting, I tried to allow bits and pieces of the under-painting to show through so a tie was created with the iconic "Mauna Kea orange". This color was my primary accent and is a nice contrast against turquoise blue. It wasn't chance that these two colors were the inspiration behind the color scheme provided to the interior designer, Eric Henderson/Henderson Design Group and in turn were the requested color scheme in this painting. As I developed this scene, I quickly realized the challenge for me would be to capture the vastness of the beach. 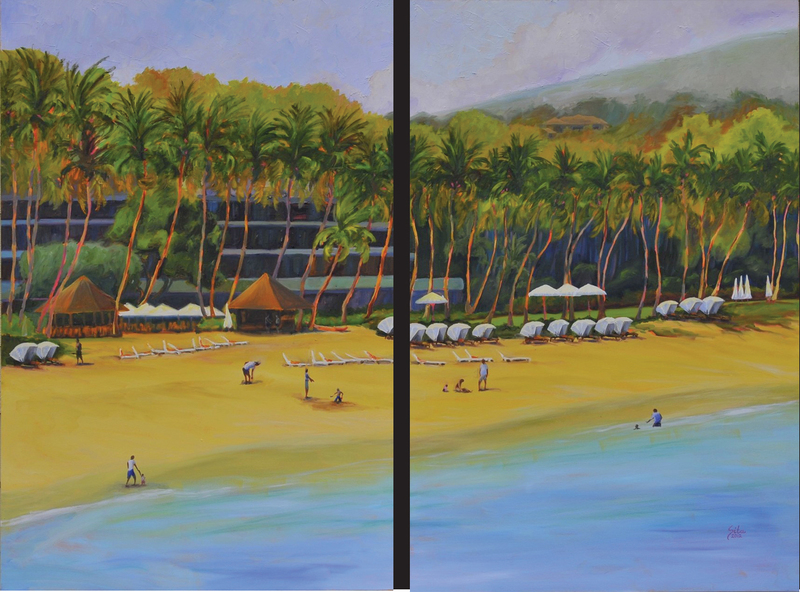 Towards the completion of the painting, I decided the best way to achieve the scale of the shoreline was to add people. I'm not the most comfortable at painting figures but drawing on the inspiration, I went forward and drew "mud people". Without worrying about details in the figures, I simply used mud-like shades to renter the faces and in turn provide a sense of the sun shading out all detail. Of course the final detail to add and the inspiration for this title, was the owner's home painted on the slopes of Hualalai barely peering over the lush foliage.